Back in October 2011, Google started encrypting their search results for users logged into a Google account. Since then, SMBs, SEOs, webmasters, online marketers and the like have been frustrated with the increasing number of (not provided) results in their Organic traffic reports in Google Analytics. Our clients have seen (not provided) search traffic in the range of 2-25+% of total traffic (more on that later). This lack of data is only going to grow. Mozilla recently announced that Firefox will soon start blocking keyword data by making all Google searches secure by default – and Chrome may well soon follow suit. It’s going to become essential as an online marketer to get as much information as possible out of this data. While there is no silver bullet solution to retrieve this invaluable data, there are a few ways to dissect it and glean some better insights. First let’s take a look at some (not provided) client data from November through February and how different industries compare. I have also pulled their percentage of Firefox traffic for the four-month range. 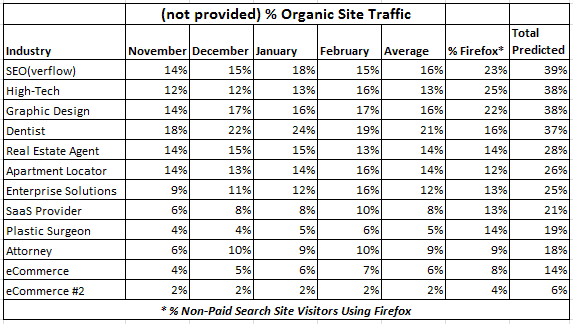 Finally, I have added the average (not provided) traffic to their Firefox traffic and guesstimated what percentage of Organic Site traffic these sites could soon be losing. Obviously this analysis is far from scientific, but as you can see there is a wide range of potential data loss. Losing 6% of your keyword data is one thing, but losing 39% could downright throw your data analysis into a tizzy! From this small statistical sample, it looks like WE have the most to lose! Uh oh… let’s take a look at a few ways to dig into the (not provided) data and make the most of this missing data. This one is pretty simple. Just browse to your Organic Search Traffic and click the “keyword” (not provided). 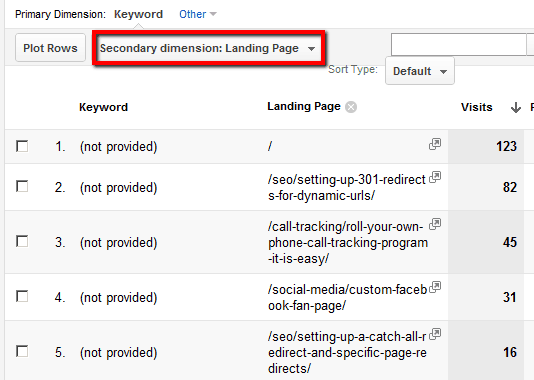 Next, set the secondary dimension = Landing Page. Voila! You can now view the (not provided) traffic by landing page. While you still cannot associate a keyword, you can get a pretty good idea whether traffic to a particular page was Branded or Non-Branded (and if it converted). This is a technique to simply estimate the percentage of branded vs. non-branded (not provided) traffic & attribute it to its proper source. This data is useful to us as an agency because when comparing year-over-year traffic data, we really aren’t comparing apples to apples because (not provided) traffic wasn’t around at this time last year. Again, not rocket science – but being able to estimate & attribute additional branded/non-branded search traffic could be the difference between a negative and a positive year-over-year comparison. If you find the two methods above useful, you may want to take it to the next level and create a filter. This method takes the landing page idea above & kicks it up a notch. It makes the data more permanent when you’re browsing around GA. If you’re looking at data as much as we are, it’s probably a good idea to set this up, pronto. First, I need to give credit where credit is due – I read about this (not provided) hack by Dan Barker here. He does a great job explaining, so I encourage you to peruse his post. Last but not least – an advanced tactic I found that lets you uncover more insight than anything else I’ve seen thus far! Again, giving credit where due – this one comes from Ben Goodsell over on SearchEngineWatch. Ben writes about how to export data from both Google Analytics & Google Webmaster Tools (both reports come from GA), then consolidate the reports to help give an identity to some of your (not provided) traffic. Webmaster Tools does not give exact data like Google Analytics, using Webmaster Tools ‘Buckets’ allows you to estimate your site’s missing traffic. This tactic requires knowledge of how to export data from Google Analytics & merging data by running a VLOOKUP. The most time consuming part is associating the ‘Next Lowest Bucket’ data with the ‘Clicks’ data from Google Webmaster Tools (If anyone has a script handy to do this let me know!). Well, that’s all I got. How do YOU dissect your (not provided) data? Please do share! What do you think the chances are of Chrome following Firefox’s lead, btw? Good question – truthfully I have absolutely no idea, but seeing as Google started doing this under the premise of “Making search more secure” this seems like a logical next step – and with Firefox taking the lead it seems they wouldn’t want to be left too far behind. Thanks for the Tactics Chris…Now if someone can build a script to do the heavy lifting for Webmaster Tools – and Google Analytics. I seem to do nothing except look at excel all day! This is the million dollar question doing SEO in the (not provided) world. PS: Lumanetrix shouted your link out. And so am I.
I wouldn’t be surprised if in the next 6-24 months Google forces all searches to secure SSL search. Which would not be good for webmasters, but something we should all be prepared for. Gather your data now while you still can!